P022: IMPLEMENTING A STANDARDIZED HANDOFF COMMUNICATION PROCESS FROM THE OPERATING ROOM TO THE INTENSIVE CARE UNIT. INTRODUCTION: The Cleveland Clinic Florida Anesthesiology Department did not have a systematic operating room (OR) to surgical intensive care unit (SICU) handoff process. Nearly half of all essential information is lost during the handover process, and communication failures are associated with twice as many adverse events compared with clinical inadequacy (1). The implementation of a standardized handover protocol has been shown to lead to improved outcomes (2). Other barriers to good transfer of care include interruptions, inadequate preparation, lack of a safety culture, and production pressure (3, 4). Up to ten different providers can be involved in a single handoff (4). Despite the Joint Commission making handoff communication a National Patient Safety Goal in 2006 (5), inadequate handoff communication still contributed to 30% of all malpractice claims in 2016, causing 1,744 deaths and $1.7 billion in costs (3). 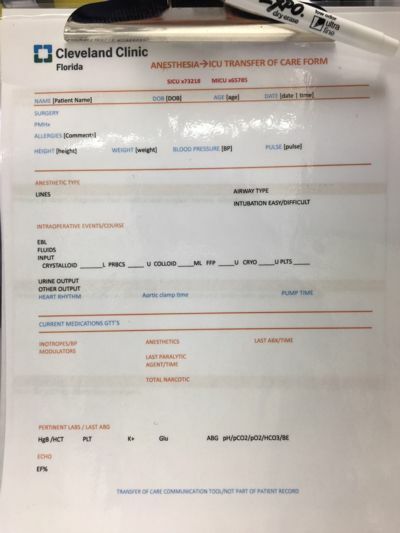 METHODS: Accordingly, a protocol was developed in October 2017 whereby the anesthesia provider is henceforth expected to call the SICU staff for handover prior to transfer as well as to complete a written form (see below). medications (especially inotropes, narcotics, and paralytics), significant intraoperative events, and recent lab and imaging results. CONCLUSIONS: Following the necessary training, it is anticipated that the next step would be to prospectively evaluate both compliance with the protocol as well as its impact on patient outcomes. 1. Moon TS, Gonzales MX, Woods AP, Fox PE. Improving the quality of the operating room to intensive care unit handover at an urban teaching hospital through a bundled intervention. Journal of Clinical anesthesia. 2016;31:5-12. 2. Hall M, Robertson J, Merkel M, Aziz M, Hutchens M. A Structured Transfer of Care Process Reduces Perioperative Complications in Cardiac Surgery Patients. Anesthesia and analgesia. 2017;125(2):477-82. 3. The Joint Commission. Inadequate hand-off communication. Sentinel Event Alert 58 [Internet]. 2017 Sep 12; (58):[6 p.]. Available from: https://www.jointcommission.org/assets/1/18/SEA_58_Hand_off_Comms_9_6_17_FINAL_(1).pdf. 4. Lorinc A, Henson C. All handoffs are not the same: what perioperative handoffs do we participate in and how are they different? APSF Newsletter: The Official Journal of the Anesthesia Patient Safety Foundation [Internet]. 2017 Oct; 32(2):[29, 31-3 pp.]. Available from: https://issuu.com/enews/docs/oct2017/2. 5. Greenberg S. Handoff communication: an APSF safety initiative and perioperative provider concern. APSF Newsletter: The Official Journal of the Anesthesia Patient Safety Foundation [Internet]. 2017 Oct; 32(2):[29 p.]. Available from: https://issuu.com/enews/docs/oct2017/2.